Ultra Music Festival website crumbles under the pre-sale rush, early bird passes already sold out? We can’t say we didn’t tell you to have your fingers ready to act fast to score early bird tickets to Ultra Music Festival, but it looks like that may not even be enough. 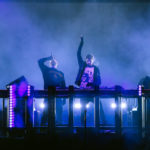 The UMF website has crumbled under the pressure of all the eager fans looking to pick up the first round of tickets, and the official word is that a whopping 50 servers wasn’t enough enough to keep up with the demand. (Is this starting to sound familiar?) Sales have been offloaded to TicketJunkie, whose website is very hit or miss at the moment. We’re still trying to get passes ourselves, but you may be luckier than us. Some DA team members have been greeted with a message that tickets are sold out, but we’re still trying to confirm that officially. Let us know in the comments if you managed to achieve the impossible! WOW! We are really feeling the love from you guys, but slow down! You just crashed 50 servers. The ULTRA 2012 ON SALE IS COMING SOON……….